Need to illuminate large outdoor areas? The TechBrite LED Shoebox Area Light Fixture is the perfect solution. The LED Shoebox Area Light Fixture features advanced designed optics for improved light utilization and evenness. It is an ideal replacement for HID/ metal halide and reduces wattages as much as 75%. 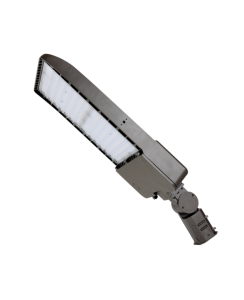 With over 100 LPW the fixture is well-suited for many applications: Roadways, industrial parking lots, residential areas, sidewalks, walkways, etc. Reduce energy, reduce maintenance costs, and improve the appearance of any outdoor environment with TechBrite LED Shoebox Area Light Fixture.